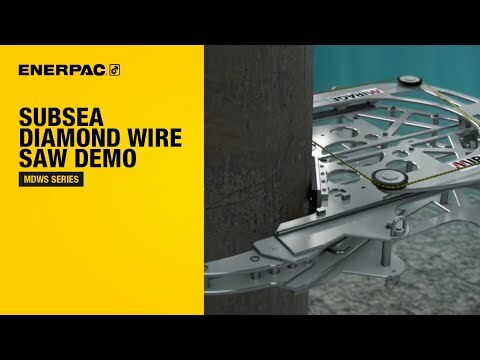 Watch the animation of the Mirage Diamond Wire Saw which is designed for underwater cutting on pipes, multistring casings, piles, platform legs and wellheads in the oil and gas industry. The Mirage Diamond Wire Saw (DWS) is a subsea or surface cutting solution designed for cutting pipelines, multistring casings, piles, platform legs, wellheads or topsides equipment. The DWS is ideal for quickly cutting through dissimilar materials and resisting compressive forces. The Mirage Subsea Deepwater Diamond Wire Saw (DWS) is a subsea cutting solution designed for deployment in deepwater and used for cutting pipelines, multistring casings, piles, platform legs and wellheads. Equipped with two modular buoyancy modules, the Deepwater DWS is rated up to 10,000ft (3,000m) of water depth. The Deepwater DWS is ideal for quickly cutting through dissimilar materials, resisting compressive forces and in a variety of subsea environments. The Mirage Subsea Manipulator Diamond Wire Saw (DWS) is a subsea cutting solution designed for rapid deployment and cutting of pipelines, casing and other subsea structures. The Manipulator DWS is ideal for repairs, decommissioning and salvage operations for a variety of subsea environments. The lightweight, compact design allows the Manipulator DWS to be easily deployed, handled and hydraulically powered by the ROV.